We are so happy to be back in the land of egg abundance! Really, it's such a gift when the hens start laying so prolifically and frittata, quiche, custards, and all manner of other things. Deviled eggs too, of course! That's Harper's speciality at the moment, which everyone is excited about. I did a crazy thing last Sunday, something I know so many other busy families do to make the week go smoothly, but I just had never tried before. Harper, Annabel and I spent most of that day in the kitchen cooking, and making all the evening meals ahead of time for the week. It has been such a relief and blessing each night to pop something into the oven that's all ready to go. It gets dinner on the table earlier (and therefore keeps bedtime reasonable), and gives us all more stress-free time together as a family in the evenings. I LOVE it. And I intend to try it again this weekend too. I'll keep you posted on how it goes and what we find for meals that work well in this way (this week it was lots of soups and casseroles). Is this something you do in your home? Farm chores this morning were a chilly affair of cold hands and frozen buckets! It really is time to dig out the gloves (I couldn't find my work gloves! ), and the layers, and find our winter groove of a morning rhythm. Each year, it seems, that rhythm changes just a little bit as our lives change. This year finds me out there with Harper as my sidekick. Papa leaves for work so early in the morning now, and the boys have left for school before it's time for chores (and before the sun has risen), and somehow my little farm girl has turned into a tween that really, really needs her morning sleep for all that growing. So she helps out with midday chores instead. And I, this year, am figuring out what I need to make it an enjoyable experience because honestly I do love that quiet early morning with the animals. It's just all about the right shoes, gloves and organizational system. Ha! But oh, it's true. The garden is...oh my goodness, giving us so much right now! Onions were just pulled to cure, the garlic that we pulled weeks ago is done curing and now trimmed and put in baskets for storage (thank you, Harper!). Loads of dilly beans are tucking into shelves here and there (thank you, Calvin! ), and did I tell you about the peaches? The peaches! Fast and furious that season was, and I barely picked up my camera in all that stretch for my hands were covered in juice. Never have I seen a peach year like this one in Maine, and how grateful we were for our mighty two trees, planted just three years ago. Last year I think we had four peaches. This year? I stopped counting after 300 pounds. From two trees! There is Maple Vanilla Peach Jam, Peach Salsa (our favorite recipe is from Naturally Sweet Food in Jars), and oh so many frozen peaches simply because we ran out of time in the days. What a gift. Our cabbage did a funny thing a week or so ago, which is that just about when they were ready to harvest, the roots filled up with a quick and heavy rainfall, thereby pushing pressure into the heads of the cabbages and causing them to burst (at least, that's what I have sussed out happened based on some reading I did about it). About half of our cabbages did that, making them not great for storage, but perfectly fine for using now. Which means...there's been a whole lot of kraut making happening with all of those heads ready to be used. Thankfully, I have a few kiddos who love eating it, and a few who love making it too. The tomatoes are just starting to come in now, and I'm tucking bits of roasted tomato sauce into the freezer here and there, knowing that probably a week from now I'll once again be elbow deep in that in the kitchen. This last week of August heading into September always feels like such a flurry to get preserved all that we hope to. And it's just so hard to imagine that only a few short weeks from now we'll have our first frost. I'm keeping that in mind these days, and enjoying the work and play of the garden. And you? How does your garden grow? It was a classic case of dinner being late, again, because....sweet peas! I think we're nearing the end of my sweet peas this year, actually, hence needing to be sure I got another round in last night (dinner can always wait). I've grown sweet peas before, but never quite as many and never quite as well. I got these as starts from a friend, and while I'm grateful to her for that, I'm also kind of cursing her. Because I don't think I can ever live another summer without sweet peas in my garden, and I'll need a whole lot more of them, please! She did that to me. Sigh. They are just so long lasting, long stemmed, and I think it's one of the best smells of summer - an armful of sweet peas coming in from the garden, or a tiny little vase next to my bed when I wake up. Oh! If only I could bottle that up for February. But then again, it wouldn't feel quite so precious if I could smell it all year long, now would it? Sorry about dinner, kids. Just wait till you grow your first sweet peas. You'll understand. The garden, this rainy morning. It's coming along, this little garden of ours. Many things feel quite late, but we're rolling with it and proceeding anyway, squeezing in a new row here and there and still planting things. I decided to try planting potatoes much later this year, at the suggestion of a few folks who declare it one way of dealing with potato bugs. But it feels so strange to have JUST planted them! Despite the late feeling, there are things coming in! Lots and lots of greens and herbs, of course. And just this morning, the garlic scapes. Some will be grilled for weekend holiday festivities and the rest pickled, I think. Or maybe I'll make a relish of them, I'm not sure yet. But deciding on what to do with them and then doing it feels like just the perfect rainy Friday morning activity as we ease on into a long weekend at home. Yes, yes. And the strawberries! Not photographed but certainly in abundance these days. I'm so pleased with our strawberry plants and the bags headed into the freezer, but even more so, the handfuls headed into the bellies of my littles. Limitless berries is kind of a magical thing about summer, don't you think? We think so! I am so excited to be starting our garden tours this season, and glad to be kicking it off with this grand garden & farm from Upstate New York! Corinne so generously shares her story, tales and advice with us here on lifelong and family gardening in a way that is sure to inspire. I hope you enjoy this stroll through her family farm as much I did! I've been gardening since I was a babe. There are old photos of me as a baby in the harvest basket next to lettuces, zucchinis, carrots, and zinnias in my parents foggy Watsonville, CA garden. As a girl I helped my mom plant seeds, pull weeds, and harvest. She was so generous with me as I'm sure I made mistakes and slowed her down. Nevertheless, I learned all the basics as a kid. In my teenage years I helped prep beds, use a wheel barrow and shovel (I was always proud of how strong I was...girls can use a mattock! ), and work with my dad in his little nursery, dividing plants and keeping them watered in the all-encompassing dry heat of Northern CA. I also apprenticed with my mother in her flower farmer business, and then went on to become the lead designer at a nearby flower farm. 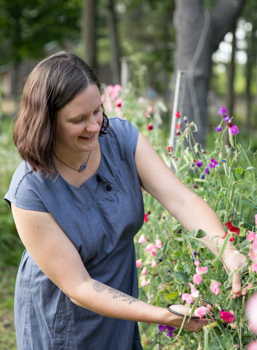 After college, I was magnetically drawn to gardening, and I worked at a variety of farms until I finally started my own with my husband in 2010. I garden for myself! I don't know how to live without gardening. Despite watching the same miracle year after year, I can't get over the giddy excitement of seeing freshly planted seeds sprout, harvesting basketfuls of abundance, cooking with the freshest of fresh ingredients, creating a mosaic of interplanted rows, trailing through seed catalogs and websites to hunt down interesting new varieties. Gardening keeps me outside, connected to the rhythms of the seasons, to the earth and the sky, and to the wild animals sharing space with me. Now that I farm for a living, I garden for my community. I've just taken my passion for gardening to the next level of sharing my bounty with my community. I'm totally hooked on growing nutrient dense, super fresh produce for my farmers market and wholesale customers. Knowing that they are enjoying meals like we are at home with divine butter head lettuce, candy sweet cherry tomatoes, and our pasture raised eggs still gives me chills every time I think about it! I garden for my kids. They can ID strange crops like fennel, borage, and parsley, basically since they learned to talk. They've grown up in the garden and the farm, and they have a deep understanding of where food comes from and natural farming and ecology. I garden for the earth. We recently switched over to no-till farming, and I am so excited for the positive impacts our little garden can make on climate change, Agriculture is responsible for about 25% of carbon emissions, everything from diesel fuel used in tractors to carbon and nitrogen being released into the atmosphere through tillage. We are broad forking our beds and topdressing with compost. Keeping beds constantly planted or covered with mulch or silage tarp. The high organic matter (i.e. carbon) in the soil is capable of sequestering huge amounts of atmospheric carbon! Plus no-till creates habitat for native ground burrowing pollinators (lots of native bees make nests in the ground). My garden is a combination of production, art palette, kids play ground, scientific laboratory, and wildlife sanctuary. We interplant like crazy, my current favorite being mini romaines planted either in between brassicas, or along the edges of tomatoes or squashes. The lettuce heads up in about 4 weeks, giving plenty of time for the slower growing brassicas or tomatoes to size up and take over the bed after the romaine has been harvested. Multi-cropping is so useful, and fulfills two of my objectives for production and art palette! The kids play so many games running up and down the 100' pathways, delighting in the abundance in the beds on either side of them. They almost always get a yes when asking if they can pick something (I'm sometimes possessive of my specialty flowers, like Icelandic poppies and ranunculus!). We currently have a young killdeer family living in the onions. There are three long legged babies at the moment, and we think there might be another nest somewhere, they are super camouflage. We also found a gorgeous luna moth in the rye cover crop when taking a walk today. Being homeschooled, the kids do a lot of their science projects in the garden. Watching the sky is another favorite past time when spending lots of time in the garden, and we sing our hellos to Canada Geese, Red Tail Hawks, the occasional Osprey or Eagle, and of course the moon and stars and sunset. Floret's blog has been a huge inspiration. Erin is so generous and successful and inspiring! Also, my husband and I try to make it to at least one farming conference a year. I was really impressed by the NOFA -MASS conference in Worcester, MA this winter. They had tons of resources for farmers, gardeners, and homesteaders alike. Not only are the workshops full of information, it is so fun to chit chat with other farmers and gardeners. Eliot Coleman, JM Fortier, Singing Frog Farms have inspired our current growing methods more than any others. Eliot Coleman's Winter Harvest Handbook is essential for winter hoop house growing, and J.M. Fortier's The Market Gardener lays out really clear tools for small-scale farming, which can be easily adapted to a smaller scale garden. We started using his recommended silage tarp for keeping the ground covered and smothering weeds before planting, and it has been a wonder! You can order custom sizes online. His website www.themarketgardener.com is full of resources. Paul and Elizabeth Kaiser of Singing Frogs Farm in Sonoma County, CA haven't written a book yet (fingers crossed), but you can find some of Paul's talks on YouTube. They are so inspiring as farmers saving the world! Plus their production is breaking records for small farms. Curtis Stone is another inspiration. He has lots of YouTube videos about his urban farm in B.C., Canada. I found him when I was researching micro-green production. His how-to videos are quick and to the point and packed full of info. For most of my adult life, the biggest challenge has been land security. I've started so many gardens in rented houses or community gardens that I've had to say goodbye to. The most heartbreaking was our 5-acre farm in Mendocino County, CA. We put so much of our hearts into this piece of land, our first real production farm, and fed so many folks out of this garden. When our landlord pulled the plug on our lease after 5 years of market gardening on the property, we made the big decision to come back east to farm my husband's family land here in Upstate NY. We knew we couldn't take the heart break of leaving another farm behind. This land is so green and lush in the summer, so harshly cold in the winter, so different from all my West Coast gardens. I am slowly transitioning, slowly falling in love with this land. And the peonies! The lilacs! oh my, flower farming here is going to be so much fun. Finding crops that picky children will eat. I feel so much pride, joy, and a sense of accomplishment when my children and nieces and nephews wander out to the greenhouse or garden and start nibbling. The micro greens have been a surprise discovery. Pea shoots and sunflower shoots are so easy to grow in a sunny window sill or a greenhouse if you are lucky enough to have one. Just soak the seeds overnight, sprout them for a day or two until little root hairs appear, then spread thickly into trays of organic potting soil. Keep the trays stacked or weighted down until green leaves begin to appear. The plants are so strong they will lift a 5 lb weight up! Then put them in a sunny location (outdoors is fine in the summer) and grow until pea shoots are 3" to 4" tall and sunflowers have big fat cotelydons with their first true leaves showing. Such a fun project to do with kids, and they love pinching off the shoots and nibbling them straight out of the trays. My kids also adore homegrown carrots (they're called "candy carrots", and they have made many a market sale by telling other kids this), butter head lettuce, sunflower shoots, pumpkins, potatoes, cantaloupes, watermelons, strawberries, raspberries, blueberries, and sunflower seeds from the garden. I'm planning a patch of sweet corn this year just for the kids, and we always make sure to have berries around to keep the kids happy. Though I will always grow a huge variety of fruits and veggies because I am a total foodie and hoarder of homegrown canned and dried garden bounty, flowers are my true love. I rather guiltily ordered 200 varieties of flower seed this year, and I don't have near enough space for them all. Flowers have been my love since I was a teen, and I am so excited by the emerging local flower scene and the wild, natural style of arrangements. In hot and dry Northern CA sunflowers, zinnias, marigolds, amaranth and celosia thrived. Here in my new Northeast climate, I think I'll be pleasantly pleased by perennials like peonies, delphinium, rudbeckia, monarda, scabiosa, and veronica, and annuals like sweat peas, larkspur, queen anne's lace and purple carrot, snapdragons, bachelor buttons, nigella, and all the cool season flowers. Dreaming of a hoop house for the dahlias, celosia, zinnias, and over wintered Icelandic poppies, ranunculus, and anemones. I already have 50 peonies in the ground (they take three years till first harvest) and 30 lilacs. Perennials are so wonderful because you just put them in, keep them well mulched against the weeds, and then let them be. Since I do garden for a living as well as a passion, I'm very conscious of how I involve my children in the garden. They are never forced to do garden chores (besides closing and opening the chickens), and we usually inspire the older two to help with promise on an hourly rate, and this usually gets a solid hour or more our of my 11 year old, and maybe twenty minutes out of my 9 year old. They really love any jobs involving sharp tools or pocket knives (yes, they are both boys.) My five year old follows me around and jumps on top of me whenever she can, and also plucks a weed or two, but mostly plays make believe games and harvests flowers and the occasional veg. They all love hanging out in the greenhouse in early spring, the older boys sometimes bring Magic or Pokemon to play while I work, and the younger one to plant beans and peas and sunflowers alongside me. We had our baby chicks in the greenhouse this spring, so that definitely kept them entertained for hours while I worked. I've heard lots of stories from elders who had no choice in helping on the family farm as children, and as a result resent farming and never want to farm again. I definitely don't want that for my kids...but I do want them to grow up understanding about where their food comes from (and how much work it is), natural farming, ecology and wildlife, botany, and environmental issues. And since they are homeschooled, the garden is really a living classroom, and we base a lot of our "curriculum" around this. I put curriculum in quotes because so much of the learning just happens naturally, and then we journal and have discussions. No-till and sheet mulching! We recently made the switch to no-till gardening, and it is amazing! We did break ground last fall on our 40 year fallow field by mold board plowing and then rototilling. Now we are building permanent beds. Here is our method: 1. Broadfork. 2. Top dress with organic fertilizer and amendments deemed necessary by soil test (we are adding rock phosphate since our phosphorus was real low) and 3" - 4" of finished compost. We are using compost from our local conservation district compost facility until we get some cows, goats, and sheep of our own. 3. Plant big healthy transplants, packing them in pretty intensively (check out J.M. Fortier's book for spacing info by crop) and interplanting fast growing crops like lettuce and radishes with slower growing crops like broccoli or tomatoes. Make sure to plant flowers and herbs on the ends of the beds for beneficial insect habitat. 4. When the crop is finished, cut with a sharp knife just under the soil, leaving the roots intact. 5. Broadfork, amend with fertilizer and compost, and replant ASAP with big healthy transplants. Over time there will be no weeds, crazy production, and soft fluffy beds thanks to the living soil web. Sheet mulching comes in very handy for perennial plantings...from peonies to fruit trees. Here's my method: 1. Make sure there are no weeds 2. top dress the tree, shrub, or bed with a thick, 4" layer of finished compost. 3. lay a double layer of cardboard in the pathways (in cases of spreading perennials like flowers, asparagus and raspberries, just sheet mulch in the pathways) and right up to the edge of the tree or shrub. Make sure the edges of the cardboard overlap, you really want to suppress those weeds. 4. Lay down a thick, 4" or so layer of wood chips. Repeat every year! Now that I live on a multigenerational family property, I have access to the family garden that has been around for almost 40 years. Last year, while we made our transition year from Northern CA to here in Upstate NY and started setting up infrastructure for our new farm, but weren't yet farming, I helped out my in-laws in their homestead garden. I had no idea how restorative this would be after the past 5 years of market gardening. I spent lots of time slowly weeding, pruning, and hand seeding, rather than using the tools and the speed I usually would for production scale. We had a pumpkin patch where all the grandkids planted their own pumpkin, watched it grow throughout the season, and then harvested in time for Halloween. We grew lots of carrots, beets, onions, celeriac, and winter squash for winter storage in the cellar, and tomatoes galore for sauce, salsa, sun drieds, paste, and ketchup. This year, with the big field going into production (still super small at 1/2 an acre), I wasn't sure if I would have the time or interest for the small homestead garden. But I find myself wandering through after work, first thing in the morning, or when I need a breath of fresh air after being on kid duty or doing lots of office work. I've planted a few of our left overs from the big field, and I really enjoy have just a few summer squash to baby along, a sprinkling of lettuces right out the front door, and the chives that are so abundant right now. I think I will thoroughly enjoy having a small space that has now become a multigenerational, shared family plot. Corinne Hansch owns and operates Lovin' Mama Farm (Lovin' Mama Farm on Facebook) with her husband Matthew. She is a full-time market gardener and homeschooling mama of three. She lives and works in upstate New York on 120 acres of multigenerational family land that recently opened its doors as a nature preserve. She is totally hooked on growing nutrient-dense, organic food for her family and community while using natural farming methods. Thank you, Corinne, for sharing your garden with us! If there is any doubt in my mind as to the reality of it being late August, I only have to step foot in the garden. For in there, it is most definitely late August! Though there is still a huge amount still left to come in - the bulk of the garden really - there is a slightly wild flair to the edges. As though to remind me who is really leading this garden dance (it surely isn't me). I might tend and cultivate and sweat my heart out inside that garden fence, but in the end, it belongs to the Earth, and there is just only so much I can do before it begins returning to the wild. This time of year, the balance tips, to be sure...as grass grows high and some weeds are let to be right where they are, and well, it all feels good really. It is as it should be. As the abundance coming inside reminds me. We were just talking at the dinner table about how what I plant definitely is not what we end up with in equal proportions. This year's weather - as dry and hot as any I remember - means different things have thrived. My brassicas are all quite happy, and oh goodness the tomatoes too! I've never had so many peppers and for whatever reason, those beets are just off the charts. But carrots, and their need for so much water early in the germination process? Not much at all. Most exciting of all right now is that the 'sunflower house' we made - just a circle of various sunflowers planted with a morning glory archway (upside down tomato cages and a piece of wire) is nearing her peak. It's a fort of green in there (that next to last photo Adelaide took from inside, looking up), and so much fun for the kids to run in and out of, and to hide out in too. I haven't tried that yet. Why haven't I? Maybe today. Another warm one is in store for us today, and after so many days out and plenty of beach time, I think we're all eager to stay home. Not in the kitchen preserving this food just yet, but rather outside and in the garden, doing a little bit of care and tending. Because really, it's only late August in garden. There's still so much more ahead. Today, you're going to love the enthusiasm and excitement Erin has for sharing her knowledge of love of gardening. And all those sweet little helpers in her garden! It's no wonder she's able to produce all they do with all that knowledge, magic and love. Garden Size: Yard is 1/5 acre, But the vegetable patch is about 200 sq ft. I have been gardening most of my adult life…I actually began gardening when I lived on a farm school in New Hampshire in High School when I was 15 and it really captured me. I have pursed it deeper and deeper every season for, well I guess that makes it 23 years now, WOW! I garden because I must!! In an ever moving and changing world, I have learned that I can get dizzy with it all, so I hunker down, kneel to the ground, I go towards the steady earth, at her center of gravity, is where I find my own. I wake in the morning eager be outside, to find the subtle or sometimes substantial changes in the green outside my door. All the growth still feels like magic to me, every season a miracle. I don’t really think gardening is a choice for me, but a necessity, it centers me and keeps me sane, nourished on every level. It just makes sense to me in a world that often doesn’t . It is simple, it is intuitive and to me it just feels like what human hands were made to do. Well there is ‘My Yard and 'My Garden’. 'My yard' is an ever evolving Permacultural Paradise that my husband started planting years ago when he bought the house. From day one began filling the empty lot 1/5 acre with every edible he could. It is lush and abundant, every edge and boundary lined with vegetation, softening our space from the world with generous, enchanted green. We have over 20 fruit tree squeezed in here, along with tons of flowers, berries and medicinals. A friends son once came over and she told him to go outside to the garden, he came back inside after a short loop around the house confused and said , "mom there are gardens everywhere!” Our house and lot is very small so we spend a lot of time outside. We have created gardens as our living space and added a greenhouse, outdoor kitchen and vegetable plot with a green lawn in it over the years. 'My Garden' on the other hand is a 200 sq ft patch in the back year hemmed in by a picket fence with neat latching gates my husband build for me. This is where I grow the vegetables, because unlike my Permaculturist husband, I wanted order and delineation between the high water vegetables and the low water perennials . 'My garden' is orderly; straight lines of lots of pretty little vegetables. It is not so much a testament to my gardening beliefs or style, but to my deep longing for order in my very chaotic homestead. It’s tidy little rows bring me calm and joy. The symmetrical garden gate and aligned nature of the lay out makes me feel that when all is in disarray, someplace in the world is in order. It is my happy place and I love it so! AHHH Gardening books… another obsession!! I have a huge book shelf of books solely about gardening and the list of loves is long.. be here are my top five. Garden Secrets by Patent & Bilerback - This is amazingly in-depth book about vegetable growing that is in-depth yet super easy to read and understand is is a must for the advid vegetable grower. Winter Harvest Handbook, Four Seasons Harvest, The New Organic Grower by Elliot Coleman- you all know him, he is the master of season extension and very detailed and meticulous. Gardening at the Dragons Gate by Wendy Johnson- This is a beautiful read and so eloquently speak to a love of gardening and its gifts for us as well as being a very useful garden guide. Not to mention the author herself is a fairy garden grandmother and completely delightful! Grasshoppers!! And lack of water in the high desert heat of course! Hundreds of pounds of vegetable grown each year! I weigh everything I grow.. but have never taken the time to sit down and add up all the numbers, but I know I grow a LOT of food off this tiny plot and not only do I feed my family, but many others as well! My children are with my all day every day, as all three of them are under 5 years old, so everything I do in the garden, they are by my side. My five year old amazed me this season, as he can transplant and tomato and sow seeds just like I thought him, which is impressive, as I can be very particular about my garden! My children go from riding along in the sling while I garden, to napping under the tomato shade while I pick, to picking right along with me. We make potting mix, sow seeds, transplant together. We harvest, weigh and wash every thing together. The garden is our classroom and we spend a good amount of time in the garden in all seasons….and when the children don’t want to garden, the swing set is right next to it, so we can still keep each other company while we do what we wish. I would say to all the southwestern gardeners out there, grow in the shoulder seasons. Spring and fall are cooler and have more moisture than our hot summers. You can grow almost year round with good planning…. the other tip is timing. Succession planting is the best way to maximize you space and efforts. As soon as one thing comes out, another goes in and you can get many crop cycles in one season and thus a steady supply of food from you garden most of the year. Intercropping help with this too, say planting cabbage in between lettuce rows….Lettuce will be harvested in a month and the cabbage will take all summer, so you can sneak in a lettuce crop before the cabbage shades it and waste no space! Thank you, Erin, for sharing your garden! Ah, today's garden was such a treat for me to see and read about, confirming my feelings that gardening connects us. Despite differences in our geography or language! Finding joy in growing food for our families, and learning patience and mindfulness from the act of doing so - these things we all share in common. I hope you enjoy this peek today. Garden Location and Zone: The highlands (~1000 m above mean sea level) on the south of Serbia, zone 6. Garden Size: 20x10 m piece for main garden and 40 trees and plants scattered throughout the full 20 hectare area. How long have you been gardening? It's the second year after our moving to Serbia and three years of «balcony gardening» before it. I love growing the free food, watching the plants and experimenting. As a child I liked to spend time in the garden of my grandparents, the house of my mother was always filled with flowers, I can't help falling in love with gardening! A few years ago I became interested in permaculture and then we moved from Moscow to a Serbian village where all my ideas can embodied. I like to visit our neighbors which have rich experience in growing plants. In Serbia all people love their gardens and many of them are trying to engage in organic farming. All this gardens are very nice and tidy, all vegetables growing in neat rows and a variety of flowers and trees impresses with its diversity. I read books and other resources about permaculture mainly in Russian. Also you can find a lot of useful information on gardening forums but most of all I like movies by Geoff Lawton. As it turned out, it is one thing is to know the theory and the other is the practical gardening. Here in the mountains is very harsh climate: strong winds from the sea and the difference between daytime and night temperatures can be 30° C (from 40° to 10°). Also we have a lot of cruciferous flea beetles that I'm trying to fight with any available methods. The magpies peck tomatoes and pumpkins, the underground living greater mole-rat eat our vegetables! Overall my fight for the harvest looks like a real struggle but I'm not going to give up. I am inspired by my pumpkin, there are a lot of them, they have a wide variety of grades and grow well. But most of all I love to grow medicinal herbs, collect new varieties and species to study their process with health benefits. I have two little boys, three and four and a half years old. They like to help me in every way! They watered the plants, transferred the seedlings, plant seeds and of course harvest. One of their favorite books is "How to grow vegetables" and now they know the name of all the varieties of vegetables that we grow. This is a great way to teach them to love there are things like lettuce or spinach :) But most importantly, they know where food comes from and its real price: they see the work for their parents and how the neighbors try to collect wheat or grazing cows. My garden is imperfect, when I coped with one problem then next appears and it is a huge challenge for my character. Usually if I fails in something then I stop doing it but we can not drop everything just because I can't grow cucumbers. So my garden teaches me patience and perhaps this is the quality which I need to develop in myself. I am 23 and I'm a mother my whole adult life. I love my children, my life in nature, my garden, I like to cook something tasty, taking pictures and writing. I have a blog http://sunbeam-house.blogspot.com. Thank you, Marina, for sharing your garden! My only visit to Washington state - just last year - left me in awe of the beauty there, and the special kind of fairy tale feeling that the woods held. In Monica's garden in that part of the world, I think she beautifully captures the magical feeling and folkloric vibe that her environment inspires. I hope you enjoy this peek into her garden, and perhaps you too will be inspired by her words about the importance of beauty in a garden space. I have been gardening for over 25 years and received my ‘Master Gardener’ status through Washington State University over 10 years ago. I was born and raised in western Washington on a small farm where gardening was an intrinsic part of our life. My childhood memories are full of wet, green springs planting seeds with my parents and grandparents; of sun-splashed summers picking strawberries and canning the fruits of our labor; of crisp autumn mornings gleaning peas and picking apples; and long, dark winters in front of a fire, our bellies full and content with the knowledge, that because of our hard work, we would never go hungry. I have always appreciated the beauty and functionality of the European potager garden. With raised beds that incorporate my vegetable, herbal and medicinal needs, not only do they offer easy maintenance, but a simple beauty, that hearkens to the romance of cottage gardens of fairy-tales and folklore. I love being surrounded by beauty, so we designed our gardens to a part of our ‘living space.’ As soon as you step out of a door in our home, you are in a garden. And one garden transitions smoothly to the next. I like to incorporate places for relaxing and contemplation, as well. And because I live in Washington state, we have covered areas, too- so we can be comfortable in the garden any time of year. I try to grow a variety of crops that I know everyone enjoys. We all love berries, so we have nine rows of raspberries, 16 blueberry bushes, and a tiered bed of strawberries- which we freeze or make into jam. My son, Elijah loves to pickle beets, so he has dedicated two raised beds to growing different varieties of beets. Cabbage is another favorite, which we make into sauerkraut and of course, who doesn’t love home-grown tomatoes?! I raised my three children (high school and college-aged now) in the garden. They turned compost and planted seeds by my side from the time they could walk. As I placed the first tiny seeds into their willing hands, I always told them about the power held within the seed’s casing- the power to heal, nurture, sustain life or take life away. I believe the most important thing we can do for children is get them into the garden. Children who garden are more adventurous and healthful eaters, and it’s a great source of exercise. But best of all, children who garden are more likely to become adults who garden. Thank you, Monica, for sharing your garden!